Over the past week, Mic, which sold to Bustle Digital Group for $5 million last year, has published new content. 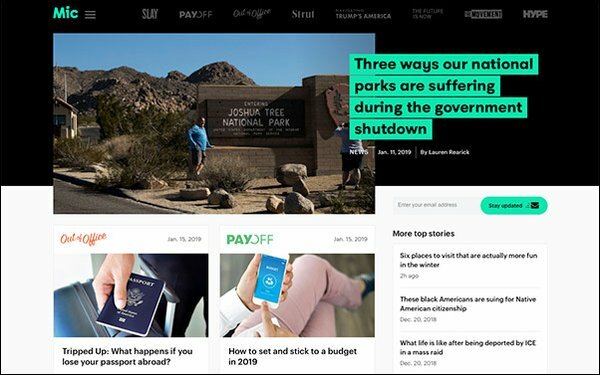 The new content follows a mass layoff at the company in late November, prior to its sale to Bustle Digital Group, that saw the majority of its 100-person staff axed. Cofounders Chris Altchek and cofounder Jake Horowitz remain at the new operation. Mic's Facebook and Twitter feeds have also rolled out the new content, created by two new writers not affiliated with Mic's unionized staff. Last September, Mic was reportedly in negotiations to sell the company to an unnamed buyer, following financial hardships stemming from the cancellation of its Facebook video series. The series was estimated to bring in $5 million over 12 months. In addition to money lost through the cancellation, the publication lost out on other sources of revenue, including potential sales and new rounds of funding, which were anticipated to follow the show’s renewal. The outlet was also hit hard by steep declines in traffic, down to 5.5 million unique viewers a month in October of 2018 from 18 million a month in October 2015, per Comscore. Once valued at hundreds of millions of dollars after rounds of fund raising, the outlet was rumored to fetch $10 million in a sale, but ultimately brought in half that. A representative of Mic’s union told The Wrap: “The NewsGuild of New York and the hard-working editorial staff of Mic are monitoring the actions of Bustle management closely, holding them privately and publicly accountable for their actions.